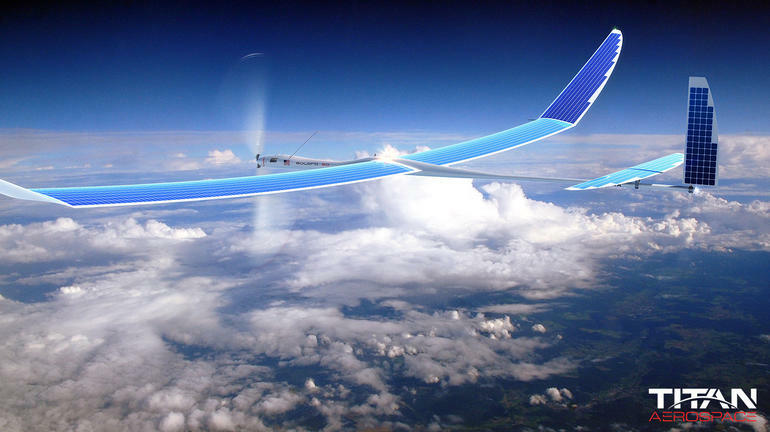 At Mobile World Congress this morning, Google’s Sundar Pichai said that Titan, the drone company Google acquired in April of 2014, would be conducting its first test flight later this year. Google bought the company after it was widely reported Facebook had made an offer. Both were interested in the drone’s ability to stay aloft for long periods of time with little energy and to carry a payload capable of providing internet connectivity to people down below. Pichai says Titan is about where Project Loon, Google high altitude balloons, was a couple of years ago. 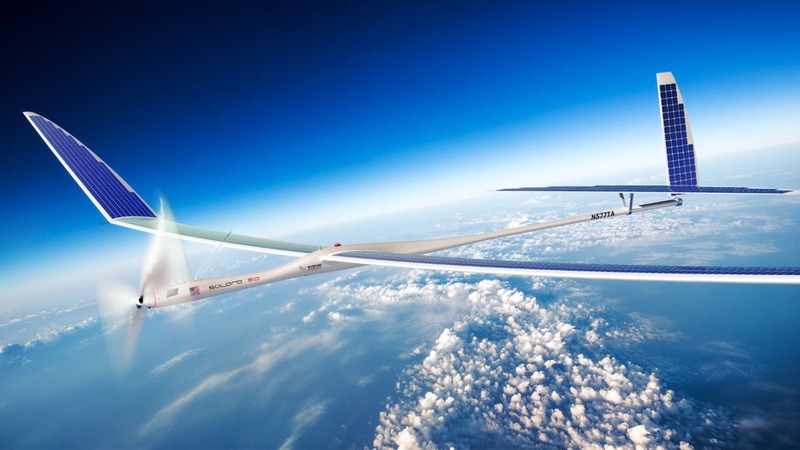 The Titan team is building a new type of super lightweight solar-powered airplane that would be capable of hovering in one area of the stratosphere. 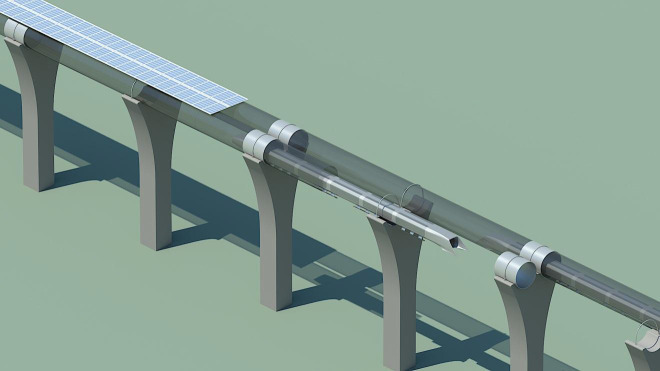 This could provide a way to beam internet down to a targeted area on the ground below, supplement existing services with extra bandwidth, or providing access in an area that’s suddenly offline, like after an earthquake or other disaster. Loon and Titan could complement each other, providing what Pichai described as a mesh of flying cell towers circling overhead. While the balloons can be tricky to steer and cover a wide area, Titan aircraft could be maneuvered to provide capacity to particular areas based on demand. In both instances, Google’s plan is to partner with carriers to provide overlapping service to people on the ground so that they don’t have to worry about exactly where it’s coming from. Pichai said the hope is to begin connecting some of the roughly 4 billion people on earth who currently don’t have reliable internet access. 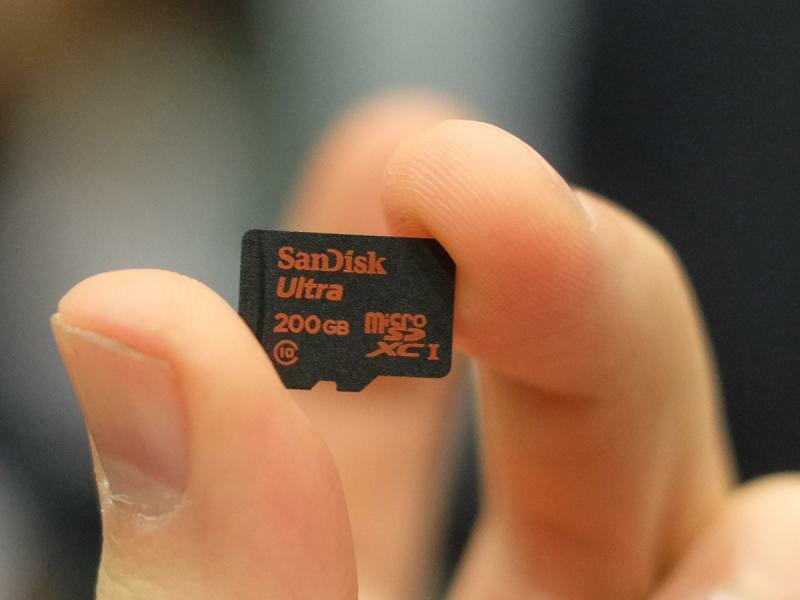 It was only a year ago that SanDisk unveiled the first ever 128GB microSD card. Now, at Mobile World Congress, the company has upped the stakes once again, announcing a microSD card with an incredible 200GB of storage. This is more memory than many modern laptops equipped with solid state drives, and can turn any Android device into a portable hard drive for music and photos. This is certainly where SanDisk is hoping the card will be useful (the company notes that seven out of 10 images are now captured on smartphones and tablets, a ratio they predict will rise to nine out of 10 by the year 2019) but the future of SD cards on mobiles is far from certain. Samsung’s new Galaxy S6 and S6 Edge both break with tradition by dropping the option for expandable storage (just as the iPhone has ever since its inception) and although HTC’s new One M9 does give customers the option, HTC is far from leading the market at this point. SanDisk’s new card does have impressive transfer speeds of 90MB/s, but that’s nothing compared to recent SSDs and there’s even some evidence that additional storage can slow down Android smartphones in general. Still, there are millions of existing Android devices that the new microSD card will work on, although with a $400 price tag, not everyone will want to upgrade. 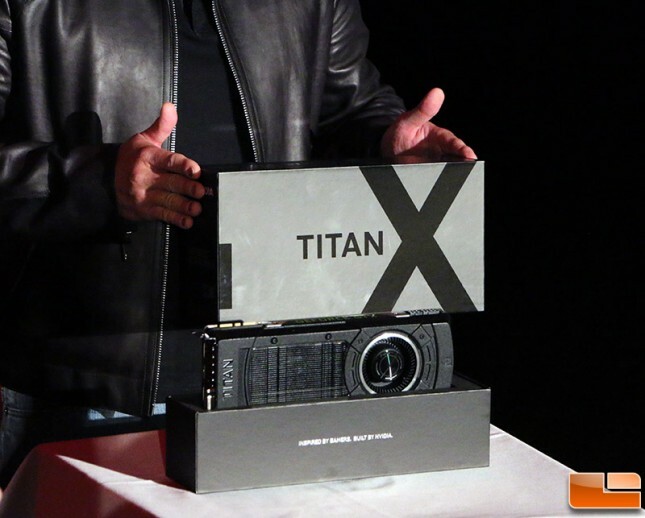 During today’s Epic Games event at the Game Developers Conference 2015, NVIDIA co-founder Jen-Hsun Huang rushed the stage like a professional wrestling hero to announce the Titan X, NVIDIA’s latest GPU. Huang claims it is the most powerful GPU on the planet. With 12GB frame buffer and 8 billion transistors, it is — on paper — a significant step past NVIDIA’s current hardware. 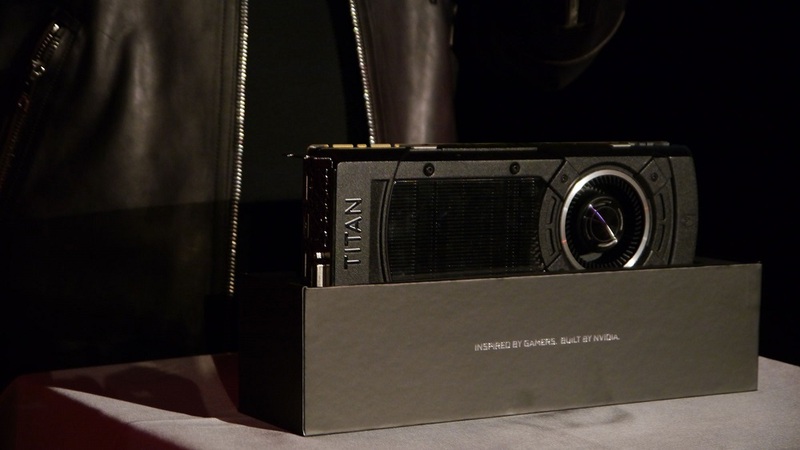 NVIDIA’s Titan used to be its most powerful hardware. The card is built using the same NVTTM cooler as earlier cards from Nvidia, but with a couple of changes. Among these changes appear to be a black design, an LED-lit text saying “TITAN,” and a green LED in the fan. 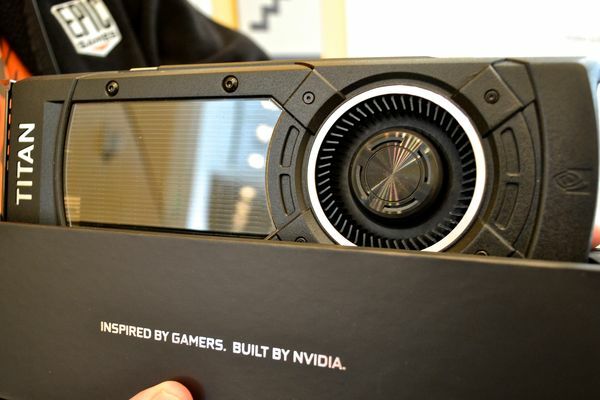 Naturally, we can probably also expect it to have a green LED-lit “GeForce” text on the side of the cooler. Nvidia did not announce when we would be hearing more about the card, when it would be available, what it would cost, or any further juicy technical details, but with GTC (GPU Tech Conf.) around the corner, something tells us we will be hearing more in just under two weeks time. 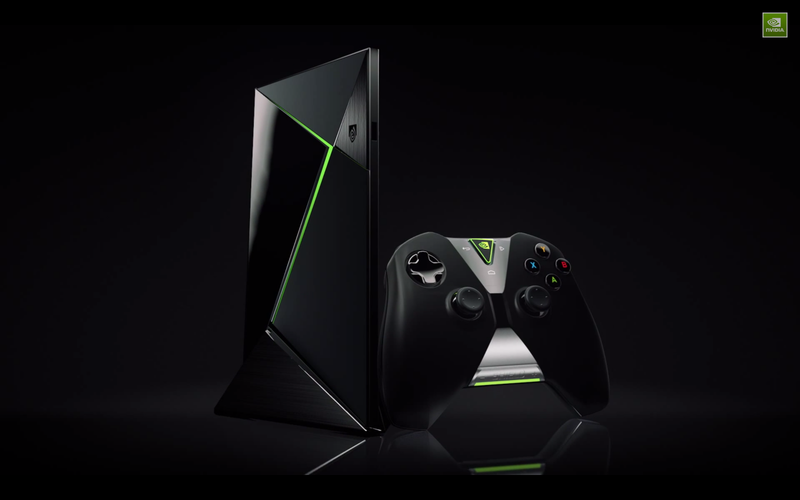 Nvidia touted three big announces at its GDC 2015 press conference, but all of them center around its latest Shield device: a home console powered by Tegra X1, running Android TV, and capable of playing games like Crysis 3 locally and streaming premium titles through its also-just-announced Grid service. 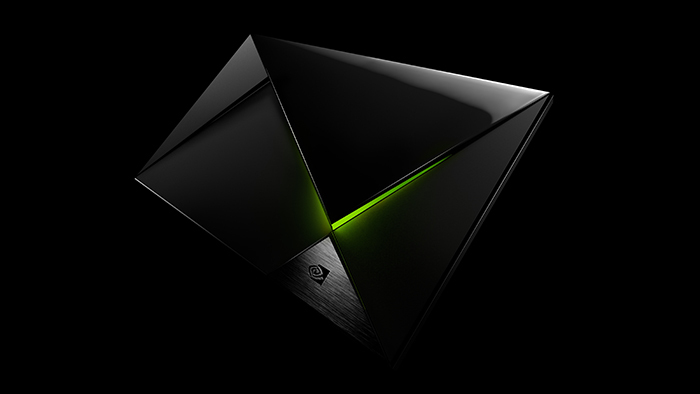 The $199 console itself, coming this May, embodies Nvidia’s design language — sharp edges, a mix of gloss and matte black, a green glow that “cracks” through the front of the system. (The controller, on the other hand, feels like the opposite of all that.) 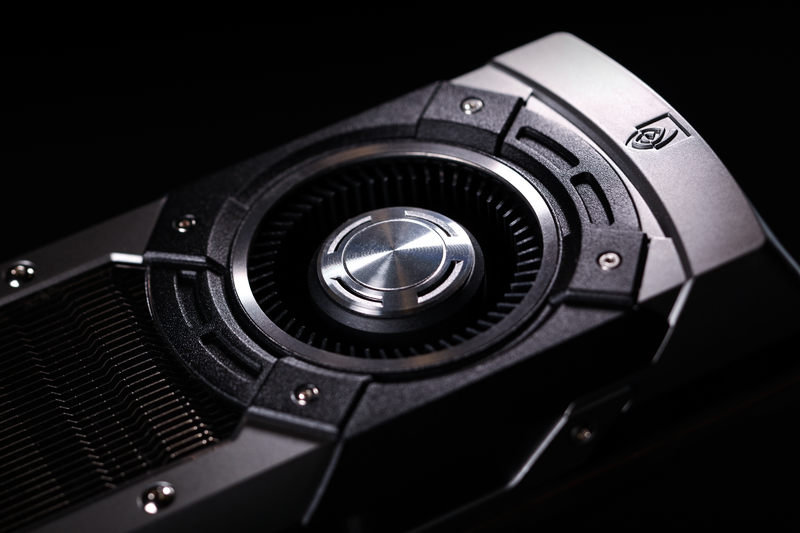 Nvidia has made a lot of promises with the capabilities, and we won’t know how well it’ll make good on those promises until we try it ourselves. But the hardware itself? Here you go! Following countless leaks and endless teasers, Samsung has officially announced the Galaxy S6 and S6 Edge smartphones. The pair of S6 phones succeed the Galaxy S5, Samsung’s prior flagship announced one year ago, and will be available across the world starting on April 10th. 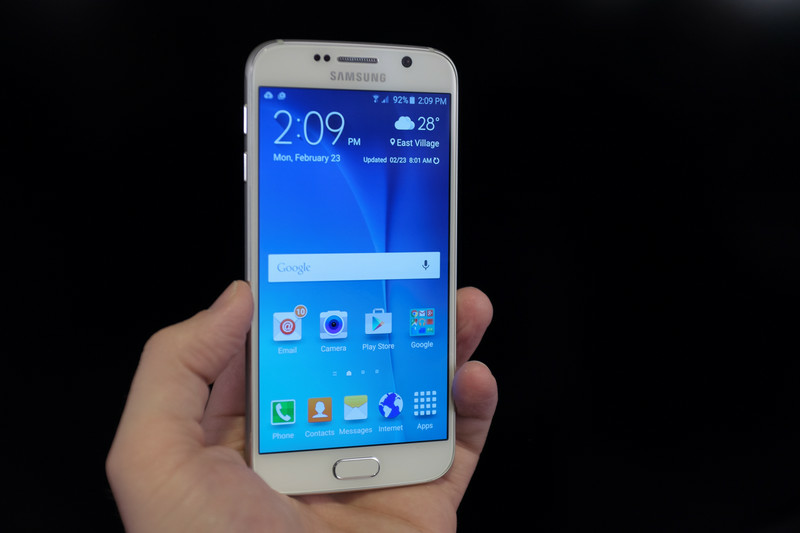 All four major US carriers plus US Cellular have committed to carrying both the S6 and the S6 Edge, while smaller carriers such as Boost Mobile, Cricket Wireless, and MetroPCS will only offer the S6. 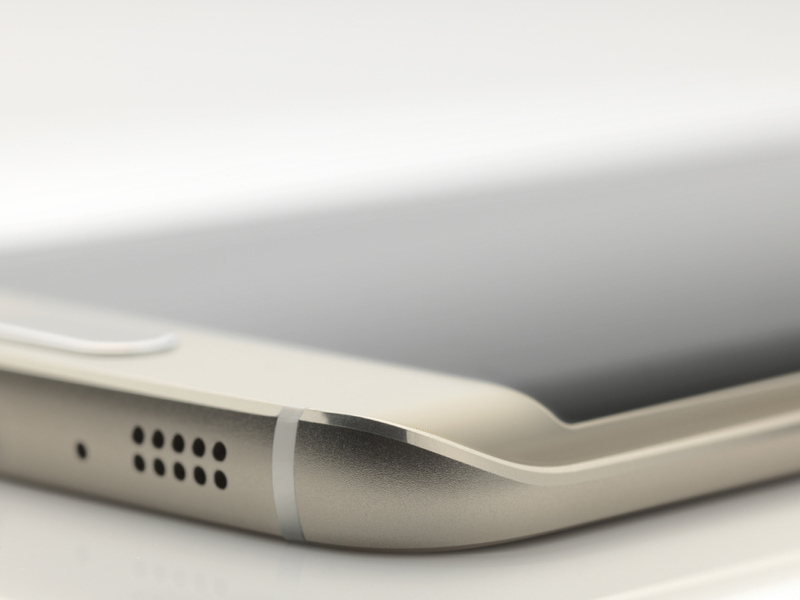 The Galaxy S6 Edge will be priced higher than the standard S6, though Samsung isn’t saying exactly how much either one will be at this point. The S5 was largely considered a misstep by Samsung: its advanced display and plentiful features were overshadowed by its plasticky build and ho-hum design, and during the course of 2014, Samsung’s smartphone profits fell dramatically as a result. Clearly Samsung does not want a repeat of the Galaxy S5 and 2014. So consider the S6 phones complete reboots of Samsung’s top-end Galaxy, a back to the drawing board approach that has resulted in the most visually stunning devices Samsung has ever produced. Where the 2014 S5 looked almost identical to 2013’s S4, the S6 and S6 Edge have all-new designs that look and feel significantly different than the older Galaxy devices. Samsung is essentially splitting its flagship model into two distinct, but very similar designs. 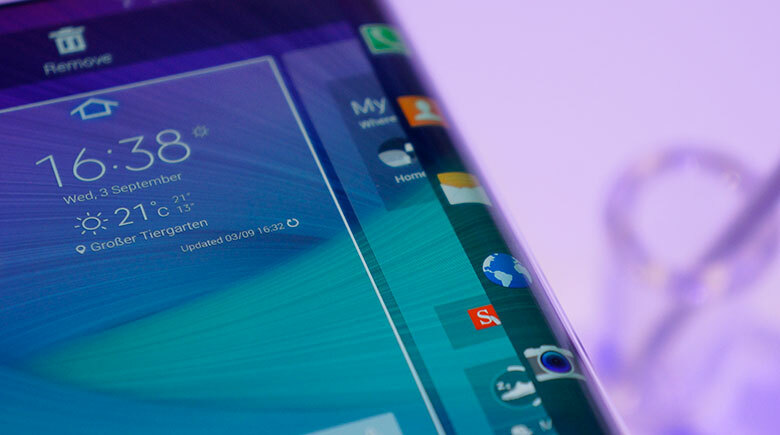 The Galaxy S6 has a flat display, metal frame, and glass front and back panels. 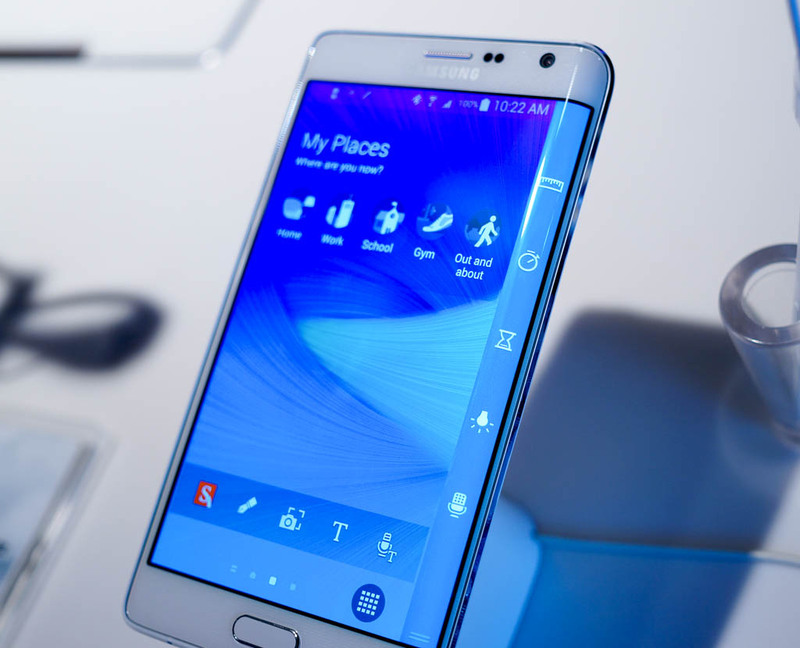 Its counterpart, the S6 Edge, has all of the above, but throws in a curve to the sides of its front and rear glass, giving it a distinctive character. The curved glass is similar to the curved display and glass Samsung utilized on the Note Edge, but it’s not as aggressive and is found on both sides of the phone instead of just the right. Needless to say, the S6 Edge is the far more interesting looking and feeling phone of the pair. Both of the new phones are made entirely of metal and glass: the cheesy and cheap-feeling plastics that have dominated Samsung’s products for years are no where to be found. This change can’t be overstated: Samsung finally has made flagship products that look and feel like they are worth the premium price tag they command. The flat S6 will be available in white black, gold, and blue, while the S6 Edge can be hand in white, black, gold, and green. Samsung’s lead designer on the project says the company spared no expense when it came to materials that they could use in the new phones. The front and rear glass panels are Gorilla Glass 4, and the metal frame is significantly nicer than the plastic used on Samsung’s prior phones (and even the metal frame used in the Note 4 and others released late last year). With Samsung competing in the high-end market against Apple and HTC, both of which use premium materials in their devices, it’s important that Samsung shows it can hang. For the most part, the Galaxy S6 and S6 Edge do. Samsung didn’t just focus on design for the new phones either. In typical Samsung fashion, the Galaxy S6 phones are packed with the latest technology: an octacore Samsung Exynos processor (for the international version, Samsung would not confirm what processor the US models will use); 5.1-inch QHD Super AMOLED displays; 3GB of RAM; 32, 64, or 128GB of internal storage; 16-megapixel cameras with optical image stabilization; a new fingerprint sensor in the home button that no longer requires a swipe; an infrared heart-rate monitor that Samsung says also helps the camera obtain accurate white balance; integrated support for both Qi and PMA wireless charging; fast USB charging that’s 1.5 times faster than the Galaxy S5; a speaker that’s 1.5 times louder than the S5’s; and integrated support for Samsung Pay, which uses either NFC or MFT (LoopPay) technology for transactions. It’s easy to see where Samsung took its inspiration for the Galaxy S6 and S6 Edge: the design is strikingly similar to the iPhone 6 in many places, and the features that Samsung did focus its efforts on are all things the iPhone has had for years. 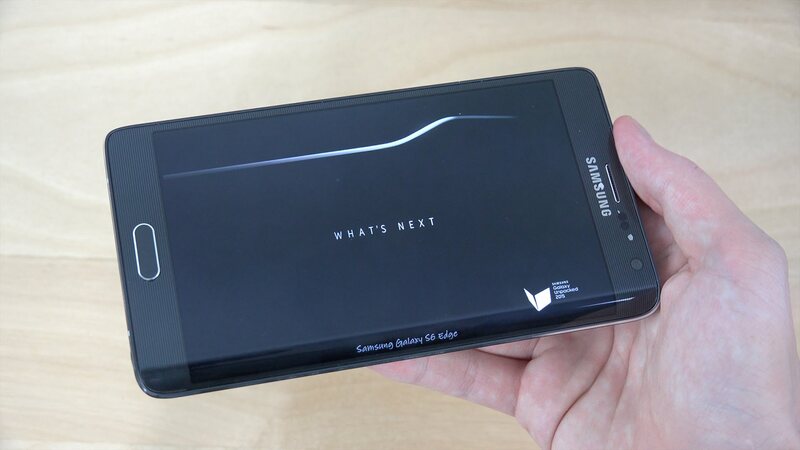 Look at the S6 from certain angles and you’d immediately think it’s an iPhone. Put your thumb on the home key and the phone unlocks almost instantly, just like an iPhone. Even the camera mount protrudes out from the rear of the phone, preventing the S6 from lying flat on a table, just like an iPhone 6. 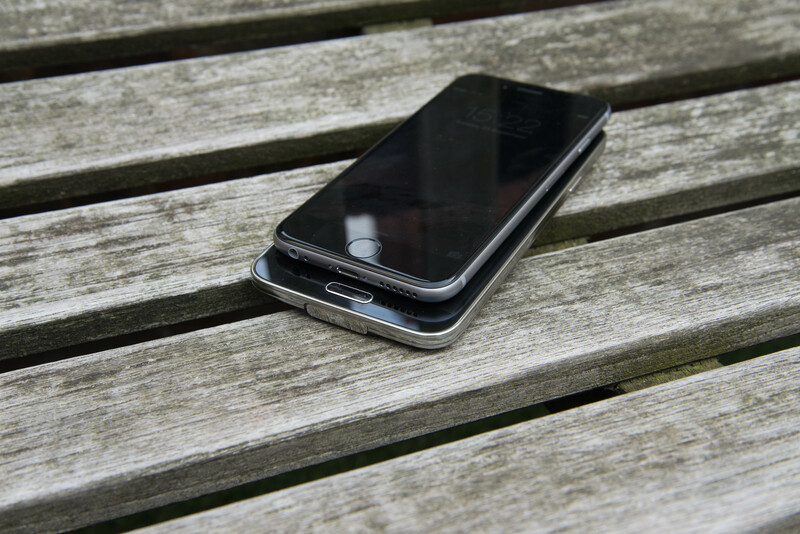 (The flat S6 looks like the lovechild of an iPhone 4 and an iPhone 6, while the S6 Edge is a little more distinctive.) Samsung has be known to copy Apple’s design before, which led to record sales and record-breaking lawsuits. It’s hard to say if the Galaxy S6 will bring about any lawsuits, but the similarities between it and the iPhone 6 are undeniable. Of the two, I’m particularly drawn to the S6 Edge. While the standard S6 has a very generic design that could have come from any number of phone makers out of China, the Edge’s curved sides look cool and make it easier to swipe across the screen. The curves aren’t overly dramatic and the symmetrical design is far better than the Note Edge’s side panel. 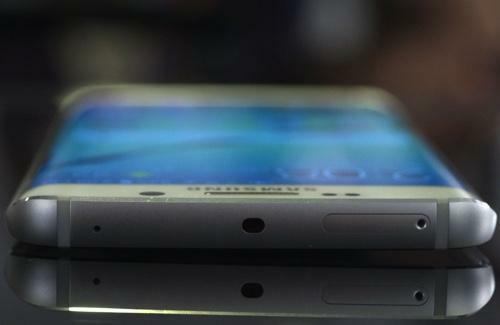 Also unlike the Note Edge, Samsung isn’t really using the curved sides to display specific information. It still has the bedside clock feature (activated by swiping back and forth on the curved part of the screen), but the news tickers, app launcher, and notifications panel are gone. Design considerations and copycat accusations aside, the Galaxy S6 and S6 Edge are sure to be great phones in their own rights. Samsung made them 2mm narrower than the S5, which doesn’t sound like much but does wonders for one-handed maneuverability. In my brief time with the two phones, performance was quick and snappy and it was easy to access all of the phone’s features with just my thumb, something I haven‘t been able to say for Samsung’s earlier devices. Perhaps most impressive is the new camera. Samsung says it has listened to criticisms levied against its past cameras and has improved the S6’s camera to address them. It’s exceptionally quick, can be launched from anywhere with an easy double-tap on the home key (Samsung says it starts up in 0.7 seconds, and I have no reason to dispute that claim), and takes sharp, well-exposed photos. It also has automating focus tracking for moving subjects, a first for a mobile device. And Samsung claims that the infrared sensor on the back of the phone used to measure your heart rate can also pulls double duty to improve white balance quality when taking photos. I have a feeling it will see far more usage assisting the camera than it will measuring heart rates when the S6 hits stores. Most of those claims will need further scrutiny once we have a review unit of the Galaxy S6 to test, but my first impressions with the camera are really good. The Galaxy S6 and S6 Edge both support Samsung’s new mobile payments program, called Samsung Pay. It uses technology Samsung acquired through its LoopPay purchaseto let you make purchases at any retailer that has a standard credit card swiper. It also works with NFC tap-to-pay systems and is authenticated with the fingerprint sensor in the phone’s home button. Between the two systems, Samsung says it will be accepted at 90 percent of retailers. Samsung Pay will work with both MasterCard and Visa, as well as American Express, Bank of America, Citi, JPMorgan Chase, and U.S. Bank. It’s very obviously Samsung’s answer to Apple Pay, but it won’t be available until later this summer, a few months after the Galaxy S6 and S6 Edge hit store shelves. Samsung is also announcing a version of the Gear VR that will work with both the S6 and S6 Edge. It’s 15-percent smaller than the Gear VR for the Note 4, and it has improvements such as USB charging. Samsung is still calling it an “Innovator Edition”, which means it’s not really designed to be used by everyday consumers. (Presumably, consumers will still be able to buy it pretty easily, however, just like the Gear VR for the Note 4.) I wasn’t able to test the S6’s Gear VR, so we’ll have to wait and see if it’s an improvement over the older model. THE S6 AND S6 EDGE ARE DRASTIC IMPROVEMENTS OVER THE S5, BUT TIME WILL TELL IF THEY ARE ENOUGH With sales falling and profits going down along with them, Samsung needed to do something much bigger and better this year than it did with the S5 last year. For most intents and purposes, the S6 and S6 Edge are just that: they are dramatically nicer and better phones than Samsung has ever produced. But it’s hard not to say that this is the phone the S5 should have been a year ago, and Samsung is still going to be playing catch up with Apple. The S6 and S6 Edge are certainly great phones, with solid performance and finally a design that Samsung can be proud of. Whether or not that’s enough to put Samsung back on top remains to be seen. Google has merged its two European regional operations, as it attempts to deal with challenges from regulators. The HQ will remain in Dublin and the changes aren’t expected to result in job losses. The company is combining its northern and western European division with the unit that covers eastern and southern Europe, the Middle East and Africa to form one organization. The new setup will be led by Matt Brittin, the former head of Google’s northern and western Europe operations. Carlo D’Asaro Biondo, who had been in charge of southern and eastern Europe, is moving to lead commercial partnerships. Google made the announcement in Brussels – the home of the European Commission – somewhere it would like the news to make an impact. The company has faced a number of political and regulatory setbacks in Europe over the past twelve months, including antitrust concerns and questions over tax. At the event in Brussels, Brittin also announced that Google will train one million Europeans in digital skills by 2016, through a new digital training hub. Google employs over 9,000 people in Europe and has made over $4.5 billion (€4 billion) in capital investments on the continent in the last four years.